#InfluencerGoals. If you don’t have them, you know someone who does. Take a quick video, snap a few selfies, multiply your Instagram hashtags, and bam! Influence. At least that’s how it’s perceived by marketers and wannabes who don’t understand how someone evolves from a content creator into an influencer. As marketers, we’re guilty of promoting that notion too. After all, brands who need help raising their profile are a dime a dozen. In short, online influence works. Influencer marketing can generate 11 times the ROI of traditional advertising, which is music to every marketer’s ears. Seems easy enough, right? It may look that way on the surface. But building and sustaining influence takes more effort than posting a handful of selfies or Snaps each week. There’s a disconnect between creators and those who want to hire them. It’s easy to overlook the investment a creator puts into building a brand, engaging an audience, and making money from their efforts. Whether you’re an online content creator, a wannabe influencer, or the agency looking to hire influencers and understand why they get paid, keep reading. With a hat tip to the Creator Monetization Report 2017, we’ll dive into who these creators are and how they produce and monetize their content as they build influence. Influencer marketing can generate 11X the ROI of traditional advertising. Bloggers: 36 percent of bloggers create video content, 17 percent do live video, and eight percent podcast. Video creators: 26 percent of video creators also create blog posts, 24 percent use live video, and seven percent podcast. Podcasters: 55 percent of podcasters also blog, 40 percent use video, and 31 percent are using live video. Creators are blogging an average of seven times per month. Those that identify primarily as bloggers tend to publish more—on average nine times per month. In addition, bloggers publish approximately eight times a month across other media channels. This includes podcasts (twice monthly), live video (twice monthly), and pre-produced video (four times a month). Week one: Two blog posts, live video hit, and a produced video that ties into one of the blog posts. Week two: Two blog posts, a podcast episode, and a produced video that promotes what’s on the blog. Week three: Two blog posts, plus one live video and one edited video. Week four: Three blogs posts, including one that ties into a podcast episode, and one produced video clip that also promotes the podcast. Tallied up, that is a minimum of FOUR pieces of published content each week. But wait, there’s more. Over the next year, creators plan on increasing their publishing frequency for video (74 percent), blog posts (66 percent), live video (58 percent), and podcasting (34 percent). How will creators change their publication frequency in the next year? A blogger committed to growing their blog and brand must continue to find opportunities to create even more content. It’s no surprise that video appears to be the medium of choice for the majority of creators, since 96 percent of all US teens watch YouTube and most consume two hours of YouTube video per day. Creators will flock to Stories (on Instagram, Snapchat, or Facebook, depending on the intended audience) to level up their video posts and uncover new ways to connect with audiences. Creating and publishing content is only one step of the creator’s process. When we evaluate influencers for our consulting clients, we do look at site traffic and social media audience sizes. But often, we cannot publicly find another key validation metric. One undeniably important audience base for influencers, however, is their email list. Successful creators rely on audience bases they can reach with new content, and email is the last surefire way to reach an audience organically. One email to subscribers weekly is a standard frequency. Subscribers will also tolerate one or two additional emails each month that feature a specific piece of content or a product, provided it adds value in exchange for their attention. Week one: Two blog posts, live video hit, and a produced video that ties into one of the blog posts, plus one email to subscribers. Week two: Two blog posts, a podcast interview, and a produced video that promotes what’s on the blog, plus one email to subscribers. Week three: Two blog posts, plus one live video and one edited video, plus one weekly email and one in-depth email to subscribers. Week four: Three blogs posts, including one that ties into a podcast episode, and one produced video clip that also promotes the podcast, plus one email to subscribers. Creators become “Influencers” with a capital “I” when they demonstrate the ability to influence or engage their audience, which doesn’t come as easily as you think. Making the leap into true influence requires additional time spent cultivating a community of your audience, getting to know them, and being present for them, beyond a blog and social media posts. Influencers have to establish credibility while maintaining a sense of approachability. Otherwise, they risk alienating the audience they are attempting to serve. Reading and responding to comments, messages, and emails. Watching and engaging (Likes! Hearts!) from within your community. Find and follow others to grow your network and reach. Participate in groups within your niche or with like-minded communities. Promoting your content and sharing content from others you follow. Expect to spend seven to ten hours weekly (minimum one hour/day) focused on community management activities. 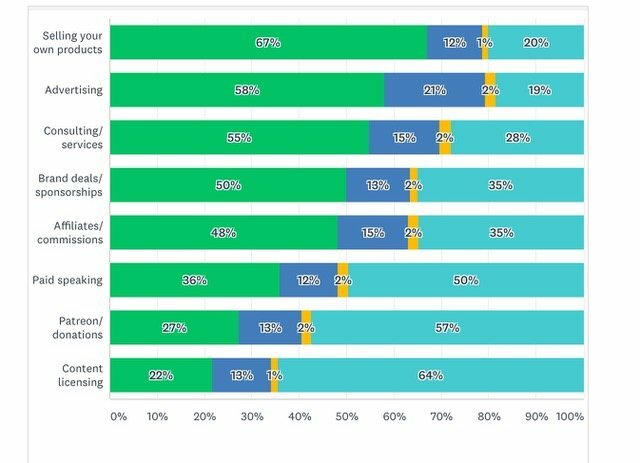 Over a quarter (28 percent) of creators surveyed for the Creator Monetization Report don’t make any money from their content. But a nearly equal number of respondents (29 percent) said online content is their main source of revenue. 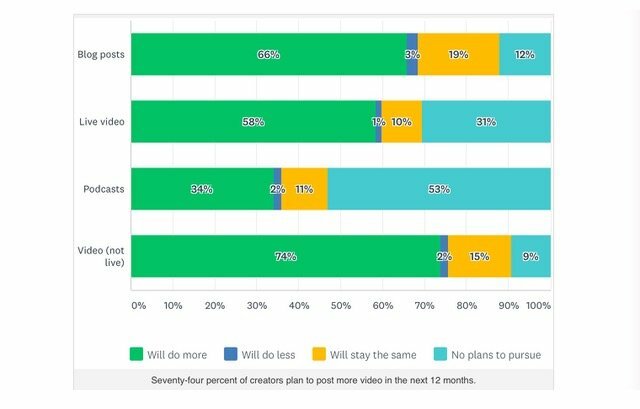 The majority of creators (62 percent) are not satisfied with their monetization income, even though creators are seeing increases in revenue year over year. Advertising is both the number one way creators monetize content and the most lucrative source of creator income. Some also subsidize their work through affiliate commissions, brand deals, or sponsorships, though usually at a lower share of total income. 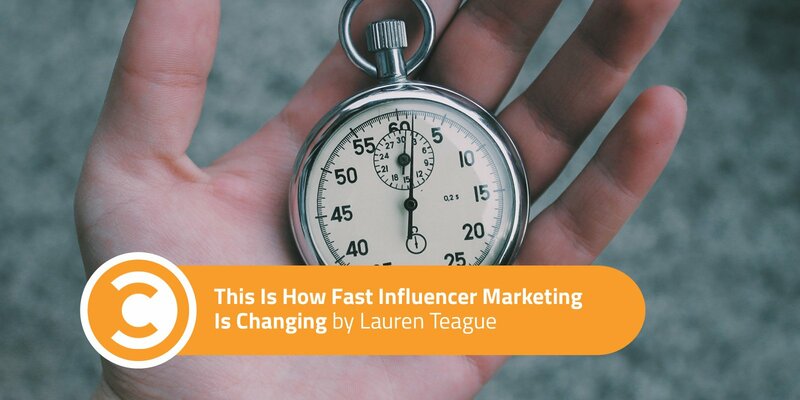 There’s no industry standard rate card for influencer marketing. Rates vary by creator, by type or number of posts, or by time spent in a branded experience. Some influencer agreements are based on quantity, but it’s not uncommon to strike a deal based on cost per engagement, cost per click, or cost per acquisition, similar to other online advertising options. Influencers with 50,000 to 500,000 followers can ask upwards of $400 for posting a single tweet, around $1,000 for an Instagram or Snapchat post, and (for video creators) $2,500 to produce a YouTube video. Creators intend to increase revenue opportunities in the next year by selling their own products, increasing advertising opportunities, consulting/services, and aligning with brands through deals or sponsorships. How will creators change their monetization plans over the next year? Making content, even a ton of content, doesn’t result in immediate influence. Creators who want to monetize their content and products aren’t settling for random acts of content. They’re focused on creating content that intentionally drives engagement and grows their audience. Influencers show up and are present for their audience base. They’re thinking beyond traditional content and creating products or services that monetize their efforts even more. Attaching recognizable faces (celebrities, athletes, etc.) to brands or products to increase awareness and boost sales is a core marketing principle. Only now, influence is more democratized. Billions of social media users have the ability to create content and build audiences around even the tiniest niche. Intention and investment are the ways influencers will separate themselves from the deep pool of creators.